Quailhurst Vineyard Estate is nestled on a hillside in Sherwood, Oregon. This 35 acre estate, built in the 1930’s, was initially renowned for its Japanese gardens, as well as its many varieties of roses. This spectacular property was purchase in 1997 by Marvin and Deborah Hausman. Marvin Hausman, born in New York, a physician and scientist by trade, along with his wife, Deborah, who was raised in the Northwest, began to renovate the property in their pursuit to breed and train competition dressage horses. The first grape vines, composed of Pinot Noir varieties from the Burgundy region in France, were planted in 1998. 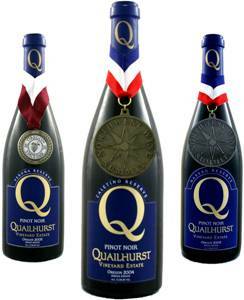 The first wine was bottled in the spring of 2001 under the Quailhurst Vineyard Estate label. This boutique vineyard produces an average of 15 tons of grapes per year. Our aim is to produce a single estate, high quality Pinot Noir composed of a select, well chosen variety of French Dijon clones. The resulting wine has the quality to be enjoyed immediately or cellared for future consumption. We invite you to explore our website, take a peaceful moment to view the beauty of our surroundings, and learn more about our wines. Enjoy the passion for the horses and the wine!